In my previous article, I examined the silence of the lambs (media) concerning the collusion between Monsanto and the FDA. In the case of medical care in America, that purposeful silence reigns supreme as well. By the most conservative estimate, researched and published by mainstream medical sources, the US medical system kills 225,000 people each year. You’d think such a mind-boggling fact would rate a relentless series of page-one stories in the press, along with top-story status on the network evening news. But no. It’s wall-to-wall silence. Why? We can list the usual reasons, the medical/pharmaceutical advertising dollars spent on television and in newspapers being the most obvious reason. We have the reality that, of those 225,000 annual deaths, 106,000 occur as a direct effect of pharmaceutical drugs. The FDA is the single government agency tasked with certifying all medicines as safe and effective before they’re released for public use. Any exposure of the medical death statistics would automatically indict the FDA. Major media won’t take on the FDA at that level. One of the many truths which would come to light in the event that the press did attack the FDA full-on? The FDA spends an inordinate amount of time, energy, and money going after the nutritional supplement industry, which causes virtually no deaths in any year or decade. The public would of course discover that, by certifying medical drugs as safe and effective, drugs that kill, like clockwork, 106,000 people a year, the FDA is colluding with, and serving, Big Pharma. You can’t possibly approve so many drugs that wreak so much human destruction through mere incompetence. Apologists for the FDA might like to think so, but they are terribly, terribly wrong. They are whistling in the dark, trusting “science” as our guide. That argument is upside down. The statistics are real and true. In fact, they are very low estimates. Therefore, the press is colluding to keep them well under the radar. The mainstream press is built to be able to maintain silence on issues such as this. It’s part of their job. Although many reporters and editors are simply ignorant and clueless, at the highest levels of media we are looking at sheer manipulation. We are looking at the crime of accessory to murder. I don’t say murder in any non-literal way. 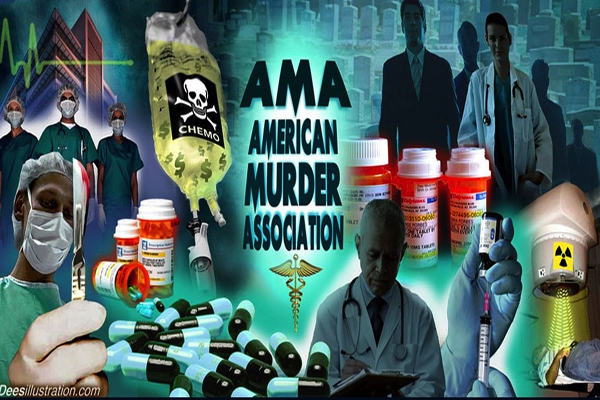 It’s murder because, when you know the facts, when you know what a huge government institution (FDA) is doing to the population, and when that institution itself is well aware of its lethal impact on the public and does nothing about it, year after year, decade after decade, it’s FDA murder and it’s media’s accessory to murder. It’s not merely negligent homicide. There is no negligence here, any more than there would be if you took a loaded gun out into the street and started firing randomly at crowds of people. And what is the public trust? It’s the false illusion that basically things are all right. That’s the simplest way to say it. Things are all right. They’re especially all right when it comes to the medical profession. Doctors are modern priests in white coats. But the priests are the ones who are prescribing the drugs that are killing people. If the extent of their crimes were made known, trust would evaporate in seconds. And not just trust in the medical profession. Trust, or the lack of it, is contagious. It spreads to other areas quickly. The press and the people who own media companies are aware they are guardians of the public trust. However, that has nothing to do with telling the truth. The press is guarding the illusion of truth. That’s how they interpret their mandate. Nowhere is this perversion more clear than in the medical arena. As I do every so often, I’m presenting my interview with the late Dr. Barbara Starfield, who for many years was a revered public health authority at the Johns Hopkins School of Public Health. She was the researcher who exposed the truth about medically caused death in America. Her review, “Is US Health really the best in the world?”, was published in the Journal of the American Medical Association on July 26, 2000. It presented three key facts. Every year, the US medical system kills 225,000 people. 106,000 die from the direct effects of FDA-approved medical drugs. 119,000 die from the effects of treatment in hospitals. Soon after her review was published, it gained some media attention. Not headline attention, but the press carried the story. Then, like a report of a car crash or a storm, Starfield’s revelation disappeared, vanished without a trace. In other articles, I’ve made it clear that Starfield’s journal paper is confirmed by other sources. In fact, on a page of the FDA’s own web site, it is admitted that 100,000 people die every year in America from the effects of pharmaceutical drugs. However, as in the case of every psychotic criminal, the FDA takes no responsibility. The FDA is supervised by the fellow that ran Monsanto. The FDA is in the pockets of the Elite is it any wonder why we are being poisoned by Elte made products? The Politicians are bought and paid for by Big Pharma. Even the heads of the AMA are a part of the greed factor. Doctors are threatened with loss of their licenses if they act independently. The MD I worked for,a Family Doctor, always prescribed the lowest dose of any well reviewed drug and rarely increased the amount. Patients usually responded, it just took a bit more time.He always spent at least 1/2 hour taking a careful history from the Patient on each visit. He always grilled the Drug Reps relentlessly on any new drugs…to the point that they had to get the drug companies to send him a written explanation in regards to the safety of the drugs.The Reps loved him but Big Pharma shunned him. He used to tell Patients to”Stay out of hospitals,their dangerous places.” He would laugh, but he knew the dangers and closely monitored all aspects of his Patients care that needed admission for serious conditions. 50 years of practice. And he delivered many healthy babies as well.He worked until he was 81 years old and was lost after retirement, from a profession that was his first love.